Deck & Baron was founded in 1976. Gregory A. Deck has been a member of the firm since its inception. Dennis J. Baron joined the firm in 1984. The firm’s newest member, David M. Baron, joined in 2017. 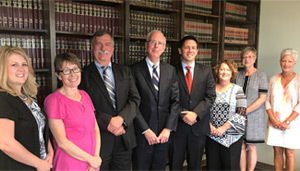 While there have been a few changes in firm members over the years, Deck & Baron has been a long standing law firm in the Kankakee area community. Many of its client relationships have existed for more than 40 years. Deck & Baron remains committed to serving both its clients and its community for many more years.